Apple fanatics are all around us, young and old. But not everyone is always able to shell out large amounts of money in order to purchase that shiny new device. There are a lot of people out there who purchase these devices from third parties. Such as Craigslist, eBay, friends/family, even random people they may meet via someone else. This is definitely a efficient way to get these devices cheaper. However, you could always end up buying a device that has been stolen from someone else. Prior to this iCloud tool that was recently set up, there was no easy way to check if the device you're using is in fact stolen. Like many electronic devices on the market, Apple devices are widely sold person-to-person. Such as people selling them on Craigslist or even eBay. There never really is a quick surefire way for you to make sure that this device isn't stolen, and is going to be 100% functional when you receive it. I'm sure anyone can agree that you would hate to buy that new Apple device you have your eyes on, only to find out that it has Activation Lock enabled since it was stolen. Well, you no longer have to worry about that, since you'll be able to check the devices status instantly. Thanks to Apple's new Activation Lock page on their iCloud website, you can easily check to see if a device is in lock down. 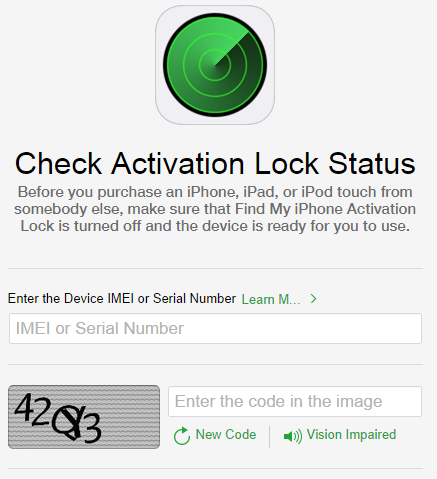 Using the devices IMEI or Serial Number, the website will perform a quick query and instantly tell you weather or not the device is currently under Activation Lock. However, this doesn't always mean that the device is waiting for you to enter in the user name and password for the Apple account associated with it. It is pretty useful to have this to test on an on-the-side phone to make sure it's "legit". It's really interesting to see when companies put forward protection like this. It probably will make a lot of people feel better about buying devices from someone other than an authorized dealer. Has anyone in the Se7ensins community ever bought a stolen iPhone...or even sold one? Let us know in the comments below!